There really are numerous benefits and advantages of owning physical gold over electronic gold or paper gold. Despite a decade having passed since the Great Recession, there is still instability in the banking system, a lack of lending, low interest rates, volatile currency markets, and we're at the start of a downward curve after stock market and cryptocurrency peaks at the end of 2017 and start of 2018. Gold offers a welcome safeguard to turbulence. Physical gold is a timeless asset which will always have a value and always lasts the test of time. Physical gold provides the ultimate insurance for your wealth against any future financial crisis in an underperforming wider economy. £50bn emergency bailout. That statement alone is enough to send chills down your spine. The old adage of 'if you don’t hold it, you don’t own it' is particularly relevant here. Physical gold offers you that layer of protection and security which Gold Exchange Traded Funds (ETFs) do not. A Gold ETF is an exchange traded fund with gold being the principle and only commodity being traded. Similar to the banking crisis, ETF companies are vulnerable, unpredictable and controlled outside your hands. Back in September 2011, the ETF company London Gold Exchange closed their website stating that they were permanently closed for business. With physical gold bullion, this would not affect you directly as you aren’t relying on any third party individual or company to look after your wealth for you. With physical gold, you hold it, you have the responsibility; you are in control of your own wealth which is the ultimate way of preserving your assets and protecting yourself and your loved ones from financial ruin if the worst case scenario did happen. While physical gold is a safe haven, we would not advise you to allocate your entire portfolio to gold. Physical gold should offer a new dimension to your wealth portfolio, perhaps initially investing only 5-10% of your liquid wealth. Many investors later choose to allocate higher percentages in the future but we find 5-10% is an ideal starting point. We encourage investors to spread their wealth. Diversification is intelligent. Just as property was a good place to invest before the 2007 crash, gold is a solid investment now. We would advise against effectively putting all your eggs into one basket as physical gold is the best way of hedging your other investments. recovers and begins to grow at a greater pace. It is an unlikely scenario where all investments will be buoyant at any one time; successful investors identify the right markets at the right time, with physical gold being a great exception to that rule as it is such a long term investment, there is never a bad time to own it. It's no surprise that a bullion company would advise everybody to hold a small amount of physical gold, but we do so with the stats to back our recommendation up. Historical data illustrates how the gold price has consistently and successfully outperformed any other investment. However, if a safe, low-risk investment is not for you, then ETFs offer a more speculative investment alternative. Another option is to delve into the best of both worlds: speculate on the price of gold via a Gold ETF as well as buying some physical gold to spread and reduce the element of risk. There is still a misconception you have to be infinitely wealthy to buy gold bullion. This is very much a British position and misconception; in countries like Germany, Austria, Turkey, and Russia, who have all experienced economic collapse in recent history, it is very common to hold physical gold bars and physical gold coins no matter what social demographic you fall into. India also, throughout history, has been a nation who position gold as a safe haven and an excellent way of protecting and preserving wealth. Most investors happily and safely store their bullion at home; after all, that is one of the major advantages of gold bar and coin physical ownership. We would advise that you take certain measures to avoid compromising the security of your investment. Firstly, don’t take any unnecessary risks: keep it to yourself. Avoid telling family, friends, and work colleagues that you have gold on the premises as you never know who's listening or who might find out. Insure your gold if you feel more comfortable and / or look into buying a small home safe for extra peace of mind; ideally one which can be hidden in the floor or wall. Alternatively, be creative. Remember - gold is easy to hide. Due to its significant value you have to own millions of pounds worth before storage becomes a real issue. Hide it in the loft, cellar, in the wall, under the floorboards, in a shoe box under the bed... the options are endless. The challenge is to hide it in the kind of place an intruder would not easily have access to if you were unfortunate enough to be burgled. If you’d rather not keep your gold within arm’s reach then for as little as £35 a year you can hire a safety deposit box from a bank. Click here to read more about our Storage offers with Brinks. When you feel the time is right to sell your physical gold, realising your investment is just as simple as offloading your Gold ETF. There are a host of reputable gold bullion dealers in the UK who buy and sell millions of pounds worth of gold every week. We’d advise you conduct research online and call up where you will be immediately offered a price for you bullion based on the current global gold spot price. It’s worth noting the bullion dealer who you purchased the gold from will often offer you the best price as part of their gold buy back service. Here at BullionByPost, if you brought your gold from us or another dealer we pay an unbeatable price of 96% of the global spot price at the time of sell. The money could be in your account the same day we receive the physical gold. 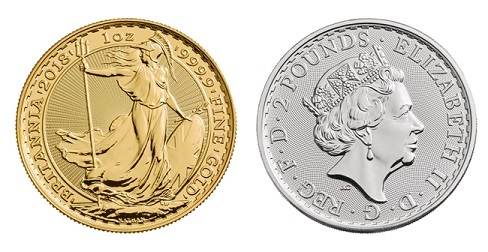 At BullionByPost we recommend everybody should own 5-10% of their liquid wealth in physical gold bars and coins. Whether you’re a pensioner with modest savings or a billionaire business tycoon, holding physical gold in your hands is a great way of safeguarding your own and your family's future. For more information about the benefits and advantages of owning physical gold bullion, see our article in published in the Sunday Telegraph - Real wealth in your hands – Eurozone crisis drives record demand for physical gold. Related Links: If you have any questions about gold bullion investment, please feel free to contact our knowledgeable and friendly team on 0121 634 8060 who will be happy to talk your through the advantages of gold. Alternatively, you can email us at [email protected] and we will get back to you as soon as possible. Storing My Gold | Should I Buy Silver and Gold | Paying Capital Gains Tax | How to Buy Gold?